Three years ago I read Marie Lu's debut novel, Legend, and I really enjoyed it, but for some reason despite buying the other two books in the series I never saw it through to the end. This year when I heard that she had a new book coming out I decided it sounded like something I would enjoy and asked the publisher for a copy. I received one but didn't end up getting to it before it came out, so I pushed it aside and said I would come back to it later. That was a mistake, I wish I would have read this book so much sooner. So often in books, YA lit especially, females are portrayed as delicate flowers or, when they're actually fully rounded, are still sweet and loving; they're good. That's bull. The whole world is not rainbows and butterflies, some people are good, some people aren't, and some are just plain confused. Adelina falls into the confused category, straddling the line between good and bad in a way that makes you slightly unsure of which side you're actually rooting for to win. On top of Adelina, the main character, the cast of supporting characters was fantastic and I fell in love with almost all of them. The other thing I adored was that Adelina was fragile. So often we see characters as weak, especially females, for accepting help, but Lu has written Adelina in a way that while she appears fragile at some points she needs help and ends up accepting it while still coming off as a whole as someone who could kill you easily. There's a distinct lack of that in YA lit, in anything at all actually, and it's something that I think is really important to highlight; that even strong people have to ask for help sometimes. Overall I was just so thrilled with this book as a whole. The twists and turns that Lu wove into the story-line were fantastic and I can honestly say that where the book ended up was not what I was expecting. I will undoubtedly read book two when it comes out and would recommend this book to just about anyone. 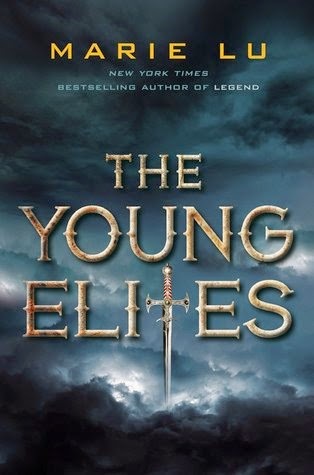 I want to say that I had some trouble getting into the book at first, it was heavy in a way that's hard to describe but that might have had something to do with the fact that this book constitutes as a high-fantasy novel, which can be slightly more bulky than other novels. There are also some dark scenes in the book that might not be appropriate for those under the age of 14, but that being said it was spectacular.